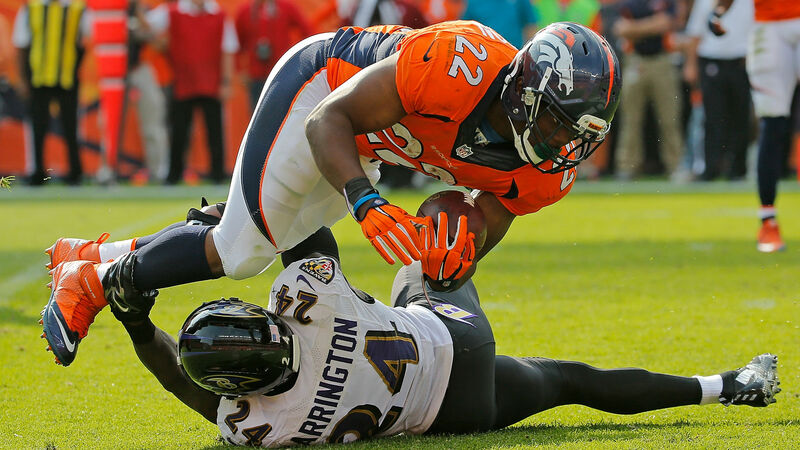 Is it Time to Give up on [Insert Underperforming Fantasy Player Here]? DeMarco Murray came into the season one of the top ranked running backs, and has put up only 8.1 points per game so far this season – falling drastically in the rankings as a result. Still, he’s doing better than C.J. Anderson who came in ranked even higher by many and through four games has put up 17.4 points, or less than Devonta Freeman and Jamaal Charles are averaging per game. As an owner of DeMarco Murray – and the also underperforming Jimmy Graham – I wasn’t too worried when DeMarco had only 36 rushing yards in his first game and Graham had 29. After all, there is a ton of variability in fantasy football and you can’t expect players to well every week. Coming off of strong 2014 campaigns, I was sure they would both step it up. But they continued to underperform, and now after a few games in I’m starting to wonder – is it time to give up on DeMarco Murray and Jimmy Graham? This is obviously a complex answer, as their play has been affected by joining new teams and by injuries, but the underlying, more general question is much easier to answer, and still very interesting: when does a player’s performance in the current season become more predictive than their performance in the previous season? To attempt to answer this, I looked at fantasy data (using PPR scoring) from The Football Database, beginning from the 2010 season and current through 2014. For each player in each week, I went through the data and found each player’s average points per game from the previous season as well as their average points per game from the current season up until the current week. I used these as my independent variables. Meanwhile, for the dependent variables, I experimented with two things. I first regressed player production in that week on the two independent variables, which is effectively measuring which of past season production and current season production most influences fantasy output in that one week – this is most useful for DFS players. 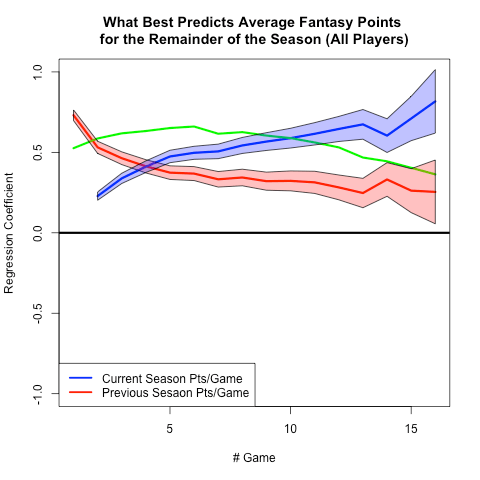 However, I am mostly in fantasy leagues and am more interested in fantasy performance for the entire season, so I did the same regression but with average fantasy points per game over the remainer of the season as the dependent variable. With after doing this, I then did a separate regression depending on what number game it was for a player in a given season, i.e. 1 through 16. I then recorded the regression coefficients for the two independent variables (previous season performance and current season performance) and plotted these, along with the 95% confidence interval and the R2 of each regression, for the various game numbers. Some final notes before we get into the results. I grouped the points not by week but by what number game it was for that player, as to control for the fact that a player could be suspended for the first few games of the season and play his first game in Week 3, ala LeVeon Bell. I only looked at players who had previous season data to regress, so no rookies (although that as another study would be interesting in and of itself). Finally, the reason I regressed on the average points per game for the rest of the season instead of the total points over the remainder of the season is that I didn’t want to add any variability due to injuries, as that is completely a separate question. The chart below shows the results looking at all players using performance for the remainder of the season as the dependent result. The red line marks the regression coefficient of the previous season performance, with the light red area being the confidence interval, the blue line and area refer to current season performance (up to that week), and the green line represents the R2 of the regression, or the percent of variance in fantasy output that our simple regression explains. Notice how the confidence intervals generally widen over time – this makes sense, as all players have data for their first game of the season, while not all have data for their 16th game, because maybe they missed a game due to injury, benching, whatever. With fewer observations later on, your variance will be larger. Also notice how the R2, the green line, peaks in the middle. Again, this makes sense – at the beginning you won’t have a lot of data from the current season to use, so your predictions aren’t as good, while at the end you are trying to predict the average of only a few games, which is more variable, and therefor you have less accuracy. As you can see, current season production becomes more predictive than past season production after a few weeks, and then remains as such for the remainder of the season. Looking at the raw numbers, the coefficients for the previous and current season are most exactly even going into a player’s forth game, and then going into the fifth game current season production becomes markedly more important. So for this weekend, when most players are playing either their forth or fifth game, you should weigh current season production more heavily than what players did last year. Although fantasy football is still incredibly hard to predict, hopefully this article helps to shed some light on when you should give up on players. I also hope you appreciate the sacrifice I am making, as a DeMarco Murray and Jimmy Graham owner, by telling you that it is likely that for the rest of the season they will perform more like they have for the past few weeks than like they did last year. Hopefully no one in my league reads this…. All data used for this post can be found on our GitHub here. EDIT: Updated the DFS charts to right ones. Did you put the correct graphs in the bottom DFS group? They look literally exactly like the full-season batch. You’re right, thanks! With so many graphs it can get confusing 🙂 We’ve updated it now! Wow, awesome stuff. For full season, which position is being referred in the 2nd bullet point above?